We've never been shy about sharing our love for secret local spots. So, when we stumbled upon the best soft pretzels we've ever eaten, hidden right here in our 'hood, we had to spill. 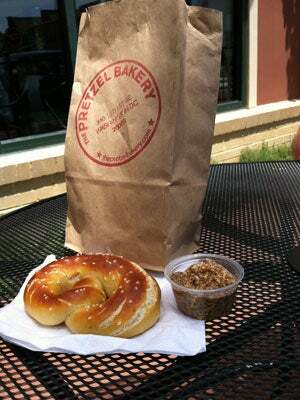 The Pretzel Bakery, a new walk-up venue in Southeast Capitol Hill, has become our go-to spot, come snacktime. Its serves up an oven-fresh, perfectly doughy, salty snack that we really just can't get enough of. These carb-o-licious confections are hand-rolled in small batches and baked steadily all day, so you'll always get a piping hot treat, and you can choose from a variety of dips (we love the whole-grain and caramel mustard options) and sodas from old-school brands like Frank's and Boylan's. Everything about this operation, from the old-fashioned drinks to the friendly walk-up service, is charming — it's the perfect pit-stop before a baseball game or a concert at Yards Park, or for a break after a day of sightseeing around the Hill. We'll probably see you in line sometime soon. When: Wednesdays through Sundays, from 11 a.m. to 7 p.m.
Where: 340 15th Street SE; 202-251-0953. Cash only.